Season both sides of the chicken with 1 teaspoon House Seasoning Blend. Put the flour in a shallow bowl or pie dish and add 1/2 teaspoon House Seasoning Blend and Italian Seasoning Blend; mix with a fork. Dredge both sides of the chicken breasts in the seasoned flour, making sure to shake off any excess. Turn on the Instant Pot and select "saute" mode, adjust heat to more; When hot, add 1 tablespoon of oil and 1 tablespoons of butter. When butter has melted, add the 2 - 3 chicken breasts into the pot and saute until golden about 3 minutes. Turn and repeat on other side. Remove the chicken to a plate and cover to keep warm. Add another tablespoon of butter and 1 tablespoon olive oil; Repeat previous step with remaining chicken. Remove second batch of chicken to the plate and cover to keep warm. Add the remaining oil and butter to the Instant Pot; When melted, add mushroom, shallots and garlic and season with 1/2 teaspoon House Seasoning Blend. Saute for 5 minutes, or until the mushrooms are lightly browned. Press "Cancel" on the Instant Pot. Add Marsala wine, sherry and chicken stock to the Instant Pot and place chicken on top of the mushroom mixture. Secure the lid on the Instant Pot and close pressure release valve. Select the "poultry" setting and adjust cooking time to 10 minutes. When the cooking time has finished, allow the pressure to natural release for 5 minutes then, carefully quick release the remaining pressure. Transfer chicken to a serving plate and cover to keep warm. Select "saute" and adjust to normal. Add heavy cream; mix to combine. Cook for about 5 minutes, or until the sauce is slightly thickened, stirring occasionally. Place chicken back in the sauce and continue to simmer for about 1-2 minutes. My House Season Blend and Italian Season Blend are so great to use in this recipe. These blends can be customized to your families taste and they make great gifts for family and friends. Store in air tight containers and use on everything for added flavor. 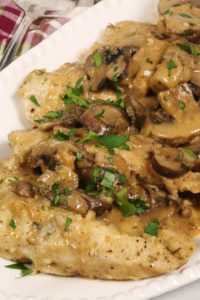 If you don't have an Instant Pot, no worries, try my delicious 30 Minute Chicken Marsala recipe. If your family doesn't like mushrooms, use an immersion blender and make a smooth sauce so they get the flavor without them knowing.